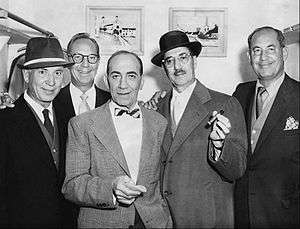 The group are almost universally known today by their stage names: Chico, Harpo, Groucho, Gummo, and Zeppo Marx. The core of the act was the three elder brothers: Chico, Harpo, and Groucho. Each developed a highly distinctive stage persona. Harpo and Chico "more or less retired" after 1949, while Groucho went on to begin a second career in television. The two younger brothers Gummo and Zeppo did not develop their stage characters to the same extent. The two eventually left the act to pursue business careers at which they were successful, as well as a large theatrical agency for a time, through which they represented their brothers and others. Gummo was not in any of the movies; Zeppo appeared in the first five films in relatively straight (non-comedic) roles. The performing lives of the brothers were brought about by their mother Minnie Marx, who also acted as their manager. The only known photo of the entire Marx family, c. 1915. 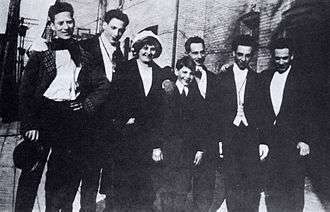 From left: Groucho, Gummo, Minnie (mother), Zeppo, Sam (father), Chico, and Harpo. Another brother, Manfred ("Mannie"), the first-born son of Sam and Minnie, was born in 1886 and died in infancy. "Family lore told privately of the firstborn son, Manny, born in 1886 but surviving for only three months, and carried off by tuberculosis. Even some members of the Marx family wondered if he was pure myth. But Manfred can be verified. A death certificate of the Borough of Manhattan reveals that he died, aged seven months, on 17 July 1886, of enterocolitis, with 'asthenia' contributing, i.e., probably a victim of influenza. He is buried at New York's Washington Cemetery, beside his grandmother, Fanny Sophie Schönberg (née Salomons), who died on 10 April 1901." Minnie Marx came from a family of performers. Her mother was a yodeling harpist and her father a ventriloquist; both were funfair entertainers. Around 1880, the family emigrated to New York City, where Minnie married Sam in 1884. During the early 20th century, Minnie helped her younger brother Abraham Elieser Adolf (stage name Al Shean) to enter show business; he became highly successful on vaudeville and Broadway as half of the musical comedy double act Gallagher and Shean, and this gave the brothers an entree to musical comedy, vaudeville,and Broadway at Minnie's instigation. Minnie also acted as the brothers' manager, using the name Minnie Palmer so that agents did not realize that she was also their mother. All the brothers confirmed that Minnie Marx had been the head of the family and the driving force in getting the troupe launched, the only person who could keep them in order; she was said to be a hard bargainer with theatre management. . The Marx Brothers were born in New York City, the sons of Jewish immigrants from Germany and France. Their mother Minnie Schönberg was from Dornum in East Frisia, and their father Simon Marx was a native of Alsace and worked as a tailor. (His name was changed to Samuel Marx, and he was nicknamed "Frenchy".) The family lived in the poor Yorkville section of New York City's Upper East Side, centered in the Irish, German and Italian quarters. The act slowly evolved from singing with comedy to comedy with music. The brothers' sketch "Fun in Hi Skule" featured Groucho as a German-accented teacher presiding over a classroom that included students Harpo, Gummo, and Chico. The last version of the school act was titled Home Again and was written by their uncle Al Shean. The Home Again tour reached Flint, Michigan in 1915, where 14-year-old Zeppo joined his four brothers for what is believed to be the only time that all five Marx Brothers appeared together on stage. Then Gummo left to serve in World War I, reasoning that "anything is better than being an actor!" Zeppo replaced him in their final vaudeville years and in the jump to Broadway, and then to Paramount films. The on-stage personalities of Groucho, Chico, and Harpo were said to have been based on their actual traits. Zeppo, on the other hand, was considered the funniest brother offstage, despite his straight stage roles. He was the youngest and had grown up watching his brothers, so he could fill in for and imitate any of the others when illness kept them from performing. "He was so good as Captain Spaulding [in Animal Crackers] that I would have let him play the part indefinitely, if they had allowed me to smoke in the audience", Groucho recalled. (Zeppo stood in for Groucho in the film version of Animal Crackers. Groucho was unavailable to film the scene in which the Beaugard painting is stolen, so the script was contrived to include a power failure, which allowed Zeppo to play the Spaulding part in near-darkness.) In December 1917 the Marx brothers were noted in an advertisement playing in a musical comedy act "Home Again". The brothers' vaudeville act had made them stars on Broadway under Chico's management and with Groucho's creative direction — first with the musical revue I'll Say She Is (1924–1925) and then with two musical comedies: The Cocoanuts (1925–1926) and Animal Crackers (1928–1929). Playwright George S. Kaufman worked on the last two and helped sharpen the brothers' characterizations. The stage names of the brothers (except Zeppo) were coined by monologist Art Fisher during a poker game in Galesburg, Illinois, based both on the brothers' personalities and Gus Mager's Sherlocko the Monk, a popular comic strip of the day which included a supporting character named "Groucho". As Fisher dealt each brother a card, he addressed him, for the very first time, by the names they kept for the rest of their lives. Julius' temperament: Maxine, Chico's daughter and Groucho's niece, said in the documentary The Unknown Marx Brothers that Julius was named "Groucho" simply because he was grouchy most or all of the time. Robert B. Weide, a director known for his knowledge of Marx Brothers history, said in Remarks On Marx (a documentary short included with the DVD of A Night at the Opera) that, among the competing explanations, he found this one to be the most believable. Steve Allen said in Funny People that the name made no sense; Groucho might have been impudent and impertinent, but not grouchy—at least not around Allen. However, at the very end of his life, Groucho finally admitted that Fisher had named him Groucho because he was the "moody one". The Marx Brothers' stage shows became popular just as motion pictures were evolving to "talkies". They signed a contract with Paramount Pictures and embarked on their film career at Paramount's Astoria, New York, studios. Their first two released films (after an unreleased short silent film titled Humor Risk) were adaptations of the Broadway shows The Cocoanuts (1929) and Animal Crackers (1930). Both were written by George S. Kaufman and Morrie Ryskind. Production then shifted to Hollywood, beginning with a short film that was included in Paramount's twentieth anniversary documentary, The House That Shadows Built (1931), in which they adapted a scene from I'll Say She Is. Their third feature-length film, Monkey Business (1931), was their first movie not based on a stage production. Horse Feathers (1932), in which the brothers satirized the American college system and Prohibition, was their most popular film yet, and won them the cover of Time. It included a running gag from their stage work, in which Harpo produces a ludicrous array of props from his coat, including a wooden mallet, a fish, a coiled rope, a tie, a poster of a woman in her underwear, a cup of hot coffee, a sword; and, just after Groucho warns him that he "can't burn the candle at both ends," a candle burning at both ends. Groucho and Chico briefly appeared together in a 1957 short film promoting the Saturday Evening Post entitled "Showdown at Ulcer Gulch," directed by animator Shamus Culhane, Chico's son-in-law. Groucho, Chico, and Harpo worked together (in separate scenes) in The Story of Mankind (1957). In 1959, the three began production of Deputy Seraph, a TV series starring Harpo and Chico as blundering angels, and Groucho (in every third episode) as their boss, the "Deputy Seraph." The project was abandoned when Chico was found to be uninsurable (and incapable of memorizing his lines) due to severe arteriosclerosis. On March 8 of that year, Chico and Harpo starred as bumbling thieves in The Incredible Jewel Robbery, a half-hour pantomimed episode of the General Electric Theater on CBS. Groucho made a cameo appearance—uncredited, because of constraints in his NBC contract—in the last scene, and delivered the only line of dialogue ("We won't talk until we see our lawyer!"). 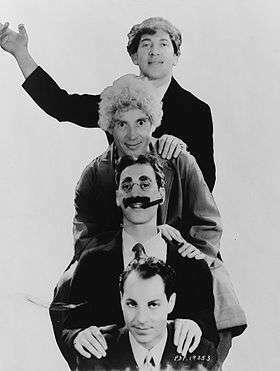 In 1970, the four Marx Brothers had a brief reunion of sorts in the animated ABC television special The Mad, Mad, Mad Comedians, produced by Rankin-Bass animation (of Rudolph the Red-Nosed Reindeer fame). The special featured animated reworkings of various famous comedians' acts, including W. C. Fields, Jack Benny, George Burns, Henny Youngman, the Smothers Brothers, Flip Wilson, Phyllis Diller, Jack E. Leonard, George Jessel and the Marx Brothers. Most of the comedians provided their own voices for their animated counterparts, except for Fields and Chico Marx (both had died), and Zeppo Marx (who had left show business in 1933). Voice actor Paul Frees filled in for all three (no voice was needed for Harpo). The Marx Brothers' segment was a reworking of a scene from their Broadway play I'll Say She Is, a parody of Napoleon which Groucho considered among the brothers' funniest routines. The sketch featured animated representations, if not the voices, of all four brothers. Romeo Muller is credited as having written special material for the show, but the script for the classic "Napoleon Scene" was probably supplied by Groucho. On January 16, 1977, the Marx Brothers were inducted into the Motion Picture Hall of Fame. With the deaths of Gummo in April 1977, Groucho in August 1977, and Zeppo in November 1979, the brothers were gone. But their impact on the entertainment community continues well into the 21st century. Many television shows and movies have used Marx Brothers references. Animaniacs and Tiny Toons, for example, have featured Marx Brothers jokes and skits. Hawkeye Pierce (Alan Alda) on M*A*S*H occasionally put on a fake nose and glasses, and, holding a cigar, did a Groucho impersonation to amuse patients recovering from surgery. Early episodes also featured a singing and off-scene character named Captain Spaulding as a tribute. Bugs Bunny impersonated Groucho Marx in the 1947 cartoon Slick Hare and in a later cartoon he again impersonated Groucho hosting a TV show called "You Beat Your Wife," asking Elmer Fudd if he had stopped beating his wife. Tex Avery's cartoon Hollywood Steps Out (1941) featured appearances by Harpo and Groucho. They appeared, sometimes with Chico and Zeppo caricatured, in cartoons starring Mickey Mouse, Flip the Frog and others. In the Airwolf episode 'Condemned', four anti-virus formulae for a deadly plague were named after the four Marx Brothers. In All in the Family, Rob Reiner often did imitations of Groucho, and Sally Struthers dressed as Harpo in one episode in which she (as Gloria Stivic) and Rob (as Mike Stivic) were going to a Marx Brothers film festival, with Reiner dressing as Groucho. Gabe Kaplan did many Groucho imitations on his sit-com Welcome Back, Kotter and Robert Hegyes sometimes imitated both Chico and Harpo on the show. In Woody Allen's film Hannah and Her Sisters (1986), Woody's character, after an unsuccessful suicide attempt, is inspired to go on living after seeing a revival showing of Duck Soup. In Manhattan (1979), he names the Marx Brothers as something that makes life worth living. In an episode of The Mary Tyler Moore Show Murray calls the new station owner at home late at night to complain when the song "Hooray for Captain Spaulding" is cut from a showing of Animal Crackers because of the new owners' policy to cut more and more from shows to sell more ad time, putting his job on the line. Harpo Marx appeared as himself in a sketch on I Love Lucy in which he and Lucille Ball reprised the mirror routine from Duck Soup, with Lucy dressed up as Harpo. Lucy had worked with the Marxes when she appeared in a supporting role in an earlier Marx Brothers film, Room Service. Chico once appeared on I've Got a Secret dressed up as Harpo; his secret was shown in a caption reading, "I'm pretending to be Harpo Marx (I'm Chico)". 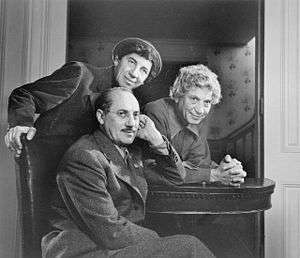 The Marx Brothers were spoofed in the second act of the Broadway Review A Day in Hollywood/A Night in the Ukraine. The "Sweathogs" of the ABC-TV series "Welcome Back Kotter" (John Travolta, Robert Hegyes, Lawrence Hilton-Jacobs, and Ron Palillo) patterned much of their on-camera banter in that series after the Marx Brothers. Series star Gabe Kaplan was reputedly a big Marx Brothers fan. ↑ "Harpo Marx, the Silent Comedian, Is Dead at 70". New York Times. September 29, 1964. p. 1. Retrieved 12 August 2016. ↑ "Groucho Marx, Comedian, Dead. Movie Star and TV Host Was 86. Master of the Insult Groucho Marx, Film Comedian and Host of 'You Bet Your Life,' Dies". New York Times. August 20, 2007. p. 1. ↑ 1900 Census shows birth year as Oct 1892 and his WWI draft registration says 21 Oct 1892 Roll #1613143, on his death certificate and his grave the year 1893 is given. ↑ "Gummo Marx, Managed Comedians.". New York Times. Palm Springs, California, April 21, 1977 (Reuters) Gummo Marx, an original member of the Marx brothers' comedy team, died here today. He was 83 years old. ↑ Adamson, Joe (1973). Groucho, Harpo, Chico and Sometimes Zeppo: A Celebration of the Marx Brothers. New York: Simon and Schuster. pp. 6–8. ISBN 0-340-18807-3. ↑ Louvish, Simon (June 2000). Monkey Business. New York, NY: St. Martin's Press. pp. 10–11. ISBN 0-312-25292-7. ↑ Simon Louvish. "Monkey Business: The Lives and Legends of the Marx Brothers: Groucho, Chico, Harpo, Zeppo With Added Gummo", The New York Times. ↑ "Mrs. Minnie Marx. Mother of Four Marx Brothers, Musical Comedy Stars, Dies.". New York Times. September 16, 1929. p. 27. Retrieved 11 August 2016. ↑ "Samuel Marx, Father of Four Marx Brothers of Stage and Screen Fame". The New York Times. May 12, 1933. p. 17. Retrieved 2016-08-11. ↑ Marx, Harpo (1961). Harpo Speaks. New York: Limelight Editions. pp. 112–113. ISBN 0-87910-036-2. ↑ "Runaway Mules Gave Marx Bros. Cue to Comedy". San Antonio Express. July 20, 1930. ↑ Archived May 18, 2015, at the Wayback Machine. ↑ "Groucho's Threat Against Nixon and 9 More Marx Brothers Stories" at mental_floss. 1 2 Joe Adamson, Groucho, Harpo, Chico and Sometimes Zeppo: A Celebration of the Marx Brothers New York: Simon and Schuster, 1973. ↑ Marx, Groucho (1976). The Groucho Phile, p. 31. ↑ Marx and Barber, p. ??. ↑ Louvish, S. (1999). 'Monkey business: The lives and legends of the Marx Brothers: Groucho, Chico, Harpo, Zeppo with added Gummo.' London: Faber & Faber. ↑ Marx, G. (1976). The Groucho Phile. Indianapolis: Bobbs-Merrill, p. 30. ↑ Marx, Groucho and Me. ↑ "BBC Radio 4 Extra - Flywheel, Shyster and Flywheel". Bbc.co.uk. 2014-05-31. Retrieved 2014-08-10. ↑ Harpo was a very skillful bridge player, and a consistent winner in the highest circles. ↑ Johnny Carson. Museum of Broadcast Communications Retrieved 2010-08-20. ↑ Gore, Chris (1999). The Fifty Greatest Movies Never Made, New York: St. Martin's Griffin. ↑ Scheimer, Lou; Mangels, Andy (2012). Lou Scheimer: Creating the Filmation Generation. Raleigh, NC: Two Morrows Publishing. p. 51. ISBN 978-1-60549-044-1. ↑ Beck, Jerry (2009-07-22). "Filmation's Marx Brothers?". Cartoon Brew. Retrieved 2014-05-10.